and Maurice Poli in Rabid Dogs. Rabid Dogs is an exceptional work in the distinguished career of Mario Bava--Italy's foremost director of fantasy and horror films. From his earliest days as a cameraman, Bava shunned the warm, neorealistic tendencies of his native cinema and embraced elements of stylization and artifice. While the terror of the situation in Rabid Dogs is hardly unusual in Bava's filmography, everything else about the film is a unique case. It is the only film he ever made which takes place entirely within the real world, in real time, on real locations; therefore, it is the only film that gives some indication of Bava's personal feelings about the world in which he lived. The violent, pessimistic and darkly ironical story of Rabid Dogs says much about why Bava sought refuge in art, why fear was his favorite subject, and why he felt compelled to stylize everything in his films--from the colored gel lighting that illumined his actors, to their unrelenting acts of violence. and Aldo Caponi in Rabid Dogs. Rabid Dogs is to Bava's career what Detour (1945) is to the filmography of Edgar G. Ulmer, a minimalist noir masterpiece that shows how much drama he was capable of conjuring onscreen with little or no means. In fact, Bava had far less to work with than Ulmer (not having the luxury of PRC's studio sets and rear- screen projection facilities) and produced arguably superior results. Filmed in the searing hot Roman summer of 1975, Rabid Dogs takes place almost entirely inside a moving car--sometimes with the windows rolled up, which helps one to understand why the actors remember the production as one of the most uncomfortable experiences of their careers! Unable to afford the luxury of a permit to shoot on the highways outside Rome, Bava cleverly rented a low flatbed truck and filmed all of the car interiors aboard this "moving set," as live scenery passed outside the windows! Directed and photographed by Bava, Rabid Dogs is not completely destylized; its compositions often have a dynamism that suggests comic book art. In technical terms, however, Bava restricts himself to realistic situations, realistic dialogue, realistic settings, and most uncharacteristic of all, realistic lighting. One gets the feeling that Bava, who was working less often than he would have liked after turning 60, was hoping that this project would redefine him as a contemporary, hard-edged filmmaker. 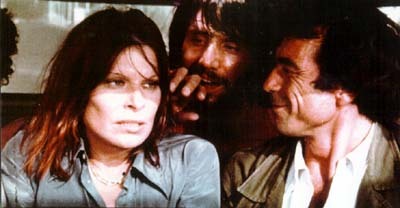 Without a doubt, had Rabid Dogs been completed and released in 1976, it would have been recognized as one of the best Italian crime pictures of the '70s, and might have given Bava's career a new lease on life--but such a success would have been inconsistent with a career inexorably tied to death and irony. Publisher's Note: Rabid Dogs is now available on DVD in a letterboxed, fully restored director's cut. It can be ordered by check or money order from Video Watchdog, PO Box 5283, Cincinnati OH, 45205. VISA and MasterCard orders are accepted toll-free at 1-800-275-8395. USA--$39.95. Outside USA--$47.00. Article and photos © 1997 Tim Lucas. All rights reserved. Tim Lucas is the editor/publisher of Video Watchdog. He is currently working on a book about Mario Bava. You can check out the Video Watchdog Web site at http://www.cinemaweb.com/videowd.